More than half of my clients bring dogs into their lives from shelters or other situations in which the dog’s history is unclear. And a fairly large percentage of those have some sort of behavioral issue, such as fear-based aggression, barrier frustration (on leash or behind doors or gates) or, the subject of today’s post, separation anxiety. Like humans, dogs are a social species. It is in part due to the human and dog social structures being so similar that the extraordinary relationship between our species came to exist at all. Dogs want and need to be with humans, which is great—until it’s not. When a dog becomes unduly upset when left alone, we call this “separation anxiety”. However, just because after you leave for work your dog tears up furniture, soils the carpet, or barks all day, it does not automatically mean he’s suffering from separation anxiety; he could just be bored out of his mind or under-exercised. You can never leave your dog alone for hours on end having not fully exercised his body and mind without expecting pushback. With true separation anxiety the symptoms occur each and every time the dog is left alone; destruction occurs at exit points, typically where people leave the house; and continues unabated until they return. There are many factors to consider in determining whether your dog has full-on separation anxiety or is just bored or otherwise improperly managed. There are two flavors of this behavior. The most common is “isolation distress” whereby the dog simply cannot bear to be alone. The second type is “separation distress” in which the dog cannot bear to part with a particular individual even when left with other dogs or humans. But since the symptoms and potential treatments are similar, we tend to lump these under the catchall diagnosis of “separation anxiety”. So that’s what it is…now what do we do about it? It is important to understand that there are no magic bullets but that in almost every case you can work towards resolution. The key word there is “work”: It takes time, commitment, creativity, and the patience of a saint. 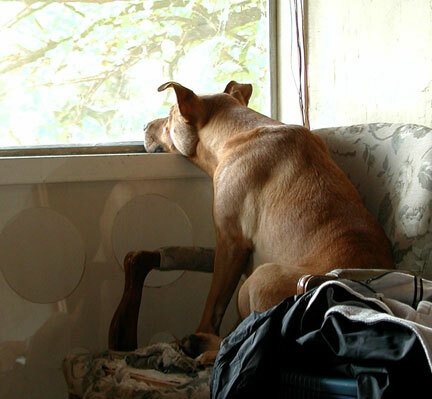 Alleviating separation issues requires a combination of desensitization exercises—such as breaking your departure routine into tiny pieces and getting the dog comfortable with each, incrementally increasing the amount of time you’re gone; and management—finding ways for your dog to not be alone as you work on desensitization. Other components of the program might include increasing exercise levels, expansion of obedience training, pressure wraps (such as the Thundershirt), and in some cases, medication. I have seen clients recoil at the very mention of medication, but sometimes it is the salve that allows all the other work to take hold. Any such medication should never be used unless combined with a comprehensive behavior modification program. Medications alone will never fix the problem. If you believe your dog has separation issues, consider hiring a professional dog trainer to help diagnose the true nature of your dog’s symptoms and to establish a program to address the problem. I also recommend an excellent book on the subject by Nichole Wilde called “Don’t Leave Me: Step-by Step Help for Your Dog’s Separation Anxiety”. Have faith in your dog and yourself. The situation is far from hopeless! This entry was posted in Dog Training and tagged dog behavior, dog separation anxiety, dog training, separation anxiety. Bookmark the permalink. Thanks for this excellent review of the problem. Well-written and precise. Someone once told me that, “dogs spend over half their lives just waiting for their owners to get home”, this really makes me look at separation alittle differently. Thankfully, my dog has got a lot better with routine.